A dental implant is an artificial root that is anchored into the jawbone to create a resistant and durable anchorage used to support a dental prosthesis that replaces one or several teeth. The dental implant serves as an intermediary between the jawbone and the dental prosthesis. As a shock absorber, it enables the transfer of the masticatory forces to the bone in which it is anchored. The missing teeth could have been extracted for different reasons (cavity, damage, fracture) or were simply congenitally (genetically) missing. 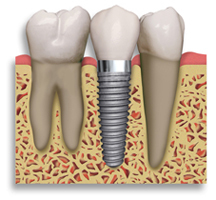 The implant is inserted into the bone, like a screw, and provides support for the visible part of the tooth: the crown. The implant can support fixed prostheses that cannot be removed by the patient like a single tooth (crown) or several teeth linked together (bridge). Several implants can also support removable prostheses (dentures) or complete prostheses to restore an entire mouth. Orthodontists do not install dental implants; this procedure is done by a general dentist, a periodontist, a maxillofacial surgeon or any other specialist in dentistry. The most commonly used material for dental implants is titanium since this bioinert metal is not rejected by the body and provides the necessary solidity to function. The ideal implant must not become altered with time by the gum tissue, the saliva and other elements of the oral cavity. Osseointegration: this phenomenon, essential to the success of the dental implant, is the colonisation of bone cells around the surface of the implant. This porous, rough and textured surface enables the bone to solidify the implant into the jaw and allows it to fulfill its supporting role. Mini-implants or temporary anchorage miniscrews used in orthodontics are not osseointegrated like dental implants, which makes it possible to remove them easily after use. The implant must support masticatory forces that come from all directions and can vary from 10 to 35 kg/cm2. Their shape may vary from one manufacturer to another. They are usually cylindrical, but other types that can be used in specific conditions also exist. Their diameter can range from 3 to 5 mm and their length is between 10 and 15 mm to fit into various jaws and types of bone that are seen clinically. Alternative materials, such as zirconium, can be used to make implants. To learn more and see examples (in French). Dental implants present different textures and designs that encourage osseointegration, an essential element for them to be solid and stable. A gingiva that is healthy and of good quality. Medical contraindications: immunodeficiency, unstable diabetes, major allergies, some heart problems, risky medical treatment (anticoagulant), etc. Anatomical considerations: quality and quantity of gum tissue, bone density, anatomy and structure, position of lower dental nerves, anatomy of upper maxillary sinuses. In certain cases, these problems can be managed by techniques of bone or gingival regeneration. Occlusion: some dental malpositions, such as teeth that are tipped too much into a toothless space, proximity of roots, excessive eruption of teeth in opposition to a toothless space, etc. 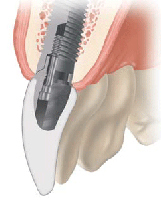 can prevent the installation of implants in an ideal position. In such cases, orthodontics can be of a great help to reposition the teeth and make the installation of implants possible. Patient’s limitations: deficient oral hygiene, lack of motivation, inadequate follow-up. The patient must realize that installing implants will require a rigorous discipline if he/she wants to ensure the success of the implant intervention. Smoking is a factor that significantly decreases the success of implants. Smokers have a poorer microcirculation of blood, which is essential to the healing of the bone around the implant and the osseointegration. The patient’s age is not really a risk factor as long as the gingiva and the bone meet the previously enumerated criteria. Significant progress was made in dental implantology since the early 1980s. Literature now reports success rates from 95 to 98%. Several implants that were installed more than 20 years ago do not present any problems. It is believed that osseointegrated implants can remain untouched for life. However, studies report a lifetime of at least 10 years in average. Important: the crowns, the bridges or the prostheses supported by an implant will have to be replaced after some time, like any other dental prosthesis. When a tooth is extracted, a certain bone loss will inevitably occur. This loss will progressively worsen throughout the years; the height and width of the bone mass may have to be increased to allow the installation of an implant. The sooner an implant is installed after the loss of a tooth, the better are the chances of maintaining the bone volume. Dental implants prevent the bone loss by allowing the masticatory forces to be distributed in the alveolar bone around the implant. The jawbone reacts to these forces by increasing the bone density, which makes it more resistant, solid and functional. The installation of dental implants and bone augmentation (grafting) procedures are performed by either a general dentist having received proper training on implants, a periodontist or a maxillofacial surgeon. New periodontal techniques to regenerate tissues contribute to the increase of the success rate of implants when periodontal tissues show certain deficiencies. Once the diagnosis is made and the feasibility of the installation of implants is confirmed, several techniques can be used to install dental implants. These procedures are usually performed under local anesthesia. An incision is made in the gum tissue, a drill bit is then used to make a hole where the titanium screw (implant) will be inserted. 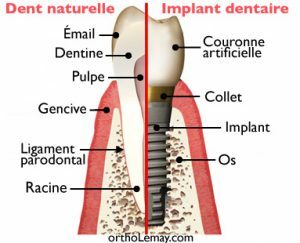 Two-step technique Implants are installed into the bone, covered by gingiva and left as is from 3 to 6 months to enable the adaptation of bone around the implant (osseointegration) and healing. After this delay, implants are uncovered (removal of the gum tissue covering them), a screw is put in place and if everything is stable in the bone, the prosthesis may then be made. One-step technique After the installation, the implants are not covered with gingiva, leaving the neck out of the bone. The prosthesis will be made once the osseointegration is obtained (3-6 months). “Immediate” technique In certain cases, it is possible for the practitioner to install an implant immediately following the extraction of a tooth by positioning it in the dental alveolus. A period during which healing and osseointegration occur is nevertheless necessary as with the other techniques. When are dental implants installed? Installing one or several dental implants often requires the intervention of several practitioners and good planning and communication between all players is essential. If you are envisioning to undergo an orthodontic treatment to correct a malocclusion, improve the position of certain teeth that you find unesthetic, to upright tipped teeth based on the dentist’s request prior to the installation of implants, etc., totally refrain from installing the implants before consulting an orthodontist. Once the implants are installed, they will not be able to be moved and can prevent optimal orthodontic corrections from being made. In other cases, orthodontics can make it possible to close significant spaces where teeth were extracted and thus lower the number of dental implants required after the orthodontic treatment and significantly decrease the restorative costs (prosthetic replacement of the missing teeth) for the patients. Sometimes, eliminating the need for several implants can go up to covering the cost of an orthodontic treatment! In rare cases, having dental implants before or during an orthodontic treatment may be beneficial. When several teeth are missing in the same area of the mouth, it is sometimes difficult for the orthodontist to find “anchorage” to install the orthodontic attachments necessary for the movements that he wants to perform. Having an implant may then provide a solid anchorage to which to put attachments, wires, elastics, etc. In such a situation, it is still preferable to make the decision to install the implant with the orthodontist and the dentist who will install the implant in order to optimally plan where the implant will be installed. The introduction of temporary anchorage mini-screws or implants in orthodontics offers new mechanical possibilities for cases with missing teeth in a way that it is now less frequent to use “permanent” dental implants during an orthodontic treatment. To learn more on anchorage miniscrews and see examples on how they are used. As described previously, it is usually preferable to install dental implants after an orthodontic treatment. However, sometimes a patient who already has a dental implant would like to envision orthodontic corrections to improve his/her occlusion. This is usually possible, but can introduce certain limits to the orthodontic treatment. Thus, since it is impossible to move a dental implant by any orthodontic movement, this can prevent the correction of certain dental malpositions. An implant cannot be moved forward, moved backward, moved downward or brought out of the bone to be “moved upward”, so the tooth replaced by the implant will need to keep the same position as the one at the beginning of the treatment. Depending on the tooth replaced by the implant, this can impact the orthodontic treatment differently. For instance, if the tooth is located at the far back of the dental arch (the second molar), this may not affect the teeth located more anteriorly unless they need to be pushed backward toward the implant. However, if an upper incisor was replaced by a dental implant and if anterior teeth must be moved backward, this is a problem, because all the incisors could be moved backward except the one replaced by the implant, which would be unesthetic and not functional. Therefore, it is possible to envision an orthodontic treatment when dental implants are present, but the treatment plan may have to be modified. The following examples show cases where implants were in the mouth before the first orthodontic consultation. Although it is still possible to perform orthodontic corrections, dental implants prevent certain orthodontic movements that would have led to better results. (A, B, C) Before this patient began the orthodontic treatment, 2 lower dental implants (indicated by the *) were installed in the mouth. Even though these implants replace premolars, they are a lot larger than a premolar. This excessive width will prevent the orthodontist from obtaining an ideal interdigitation with the upper teeth. However, these two implants do not prevent corrections to be made in the other areas of the mouth (in the upper arch and the anterior part of the mouth). Moreover, it would have probably been possible to close these spaces during the orthodontic treatment and avoid the need for implants after the orthodontic treatment. (A) Correcting this malocclusion would require a backward movement of the upper left teeth to obtain a better interdigitation (arrow). (B) The presence of a dental implant (indicated by a *) at the back of the dental arch will prevent the teeth from being moved backward, because the implant installed before the treatment cannot be moved. (C) Upper occlusal view of the crown on implant. If this person had consulted an orthodontist before installing the implant, the suggestion would have been to wait the end of the treatment and the backward movement of the teeth to install this implant. The final occlusion and function would only be better. Orthodontics can be essential to allow the installation of dental implants in certain types of cases. When there is not enough space to place an implant between 2 teeth or when dental roots on both sides of the space where the implant will be installed are badly inclined, orthodontic movements can be the only solution available for patients in order for them to envision the installation of implants predictably and with better chances of success (prognostic). These corrections may be complex when the patient shows a significant malocclusion that needs to be corrected as well or relatively simple and fast when it comes to changing the position of a few roots only without any other major corrections (see the examples below). Not only the tooth! An optimal tooth “alignment” before installing implants is not evaluated only by looking at the position of the crown of the tooth (visible part out of the gingiva), but also by evaluating the position and the relationship of their root(s). Depending on the type of implant to install, a minimum of ± 7 mm of available space is required where no roots must be in the way. An adequate inclination of the roots may prevent having this critical space. Planning orthodontic movements is very important to allow the installation of implants by the clinician (maxillofacial surgeon, periodontist, dentist, etc.) following the orthodontic treatment. Strict standards must be followed to allow the installation of the dental implant that will support the crown. The orthodontist works in collaboration with the dentist to determine the ideal position of the teeth and roots. To properly resist masticatory forces and have a maximum lifetime, dental implants must be placed precisely in the alveolar bone of the jaws. The orthodontic corrections make it possible to optimally position the teeth adjacent to the sites where the dental implants will be installed to maximize the chances of success. CC’s case: Anodontia of lateral incisors and inadequate position of the canines for the installation of the dental implants. 32-year-old woman with the upper lateral incisors congenitally missing (anodontia) and who underwent an orthodontic treatment when she was a teenager. After the orthodontic treatment, the lateral incisors were replaced by several means before opting for Maryland bridges (resin-retained bridge). She now wishes to replace these bridges by crowns supported by dental implants. However, the dentist who plans the installation of the implants concludes that there will not be enough space between the roots of the canines and the central incisors, because the roots of the canines are tipped too much toward the space that must receive the implant. The position of the central incisors is adequate. A radiographic evaluation is essential to the planning of such cases. A Cone Beam Computed Tomography (CBCT) scan makes it possible to do a complete and precise evaluation of the position of the teeth (roots and crowns) and of the surrounding bone and to precisely plan the orthodontic movements to perform in order to provide the space required by the dentist to install the implants. Maryland bridges that replace both upper lateral incisors. This 32-year-old woman underwent an orthodontic treatment once when she was a teenager and now wishes to replace the Maryland bridges (indicated by the arrows) by crowns on dental implants. These bridges have been in place for more than 10 years. Use of CBCT scans to evaluate the position of the roots of the upper canines and lateral incisors to get ready for the installation of dental implants to replace the missing lateral incisors (yellow *). (A) The red dotted lines indicate the axis (inclination) of the teeth before the treatment and the blue dotted lines represent the ideal position that the lateral incisors should have to allow the installation of implants without interfering with the dental roots. (B) Slices to the fraction of millimeter allow a precise evaluation of the bone and roots. (C) Sagittal or side view. (D) Occlusal or axial view through the crowns and the roots showing the space and the bone between the teeth. CP’s case: Anodontia of lateral incisors and inadequate position of the central incisors to install dental implants. 20-year-old woman who wishes to replace her missing lateral incisors with dental implants. This case is similar to the previous one; the young woman underwent a first orthodontic treatment when she was a teenager, but the position of the roots of the upper central incisors does not allow the dentist to install implants properly. Therefore, to maximize the chances of success, he recommended to use orthodontics to better align the roots of the anterior teeth, the central incisors in particular. In this kind of case, even though 2 teeth are mainly concerned by these corrections (the central incisors in the case below and the lateral incisors in the previous case), it is necessary to put appliances on at least the 6 anterior teeth and one posterior tooth to properly control the orthodontic mechanics and the forces used. Therefore, the treatment plan solely aims at changing the position of the central incisors by tipping the roots mesially (toward the middle). When the orthodontist believes that the teeth are in a good position, a radiological verification is done and the patient is directed to the dentist who will install the implants for a final verification and approval of the corrections made. Since the upper central incisors show too much tipping, they will prevent the installation of dental implants to replace the missing lateral incisors. (A) Before the treatment: the blue arrows indicate the missing lateral incisors. (B) These lateral incisors are replaced by prosthetic teeth bonded to the adjacent teeth. (C) A panoramic radiograph confirms the bad position of the central incisors. (D) Enlarged view of the radiograph and the implants added as a simulation. The blue dotted lines represent the ideal position that the central incisors should have. (E) This patient opted for lingual braces for esthetic reasons. The same principles apply to the posterior area of the mouth where adults frequently have one or several extracted teeth that made the adjacent teeth to tip toward the space created by the extraction. Particularly, the molar behind the space tends to migrate forward, but it will always move by tipping at different angles. This often prevents the ideal installation of an implant and orthodontic corrections will make it possible to fix the problem by giving the tipped teeth (and roots) a normal inclination, by opening the space that narrowed over time and by allowing the installation of implants. To learn more on the uprighting of posterior teeth. (A) Posterior teeth that tipped forward several years after a 46-year-old woman lost a molar. (B) The teeth were uprighted orthodontically by moving them backward (arrow). Once the space was obtained, another specialist (periodontist or surgeon) installed 2 implants to replace the missing molar. (C) Final result once the general dentist installed the crowns on the implants (arrows). (A) This orthodontic treatment aimed at repositioning the lower teeth in order to replace the missing teeth with dental implants. The teeth were uprighted and the space was opened optimally to receive the implants. (B) At the end of the orthodontic treatment, the corrective appliances (braces) were removed except the ones beside the spaces where a section of wire (arrows) maintains the teeth on each side of the space so they do not move while waiting for the installation of the implants and the crowns. A regular fixed retention wire maintains the anterior teeth in place. (C) The implants were installed during the retention period. The lower left implant is indicated by the arrow. (D) Once the implants and the crowns are installed, it is no longer necessary to keep the sections of wire.